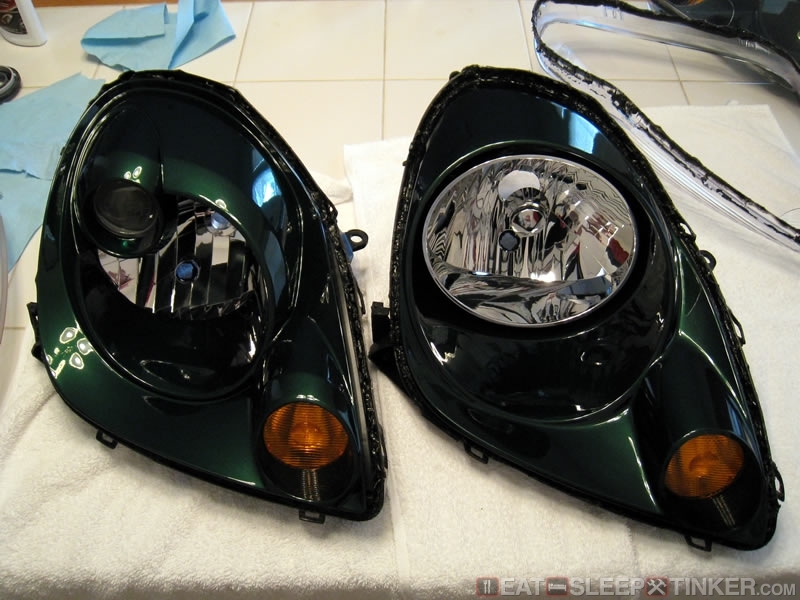 The common MR2 Spyder headlight conversion / upgrade, updating the older pre-facelift cars to the later projector style headlights. There are several different techniques out there for wiring up post face-lift headlights to a ’00-02 car, but I wanted to see if there was a better method. 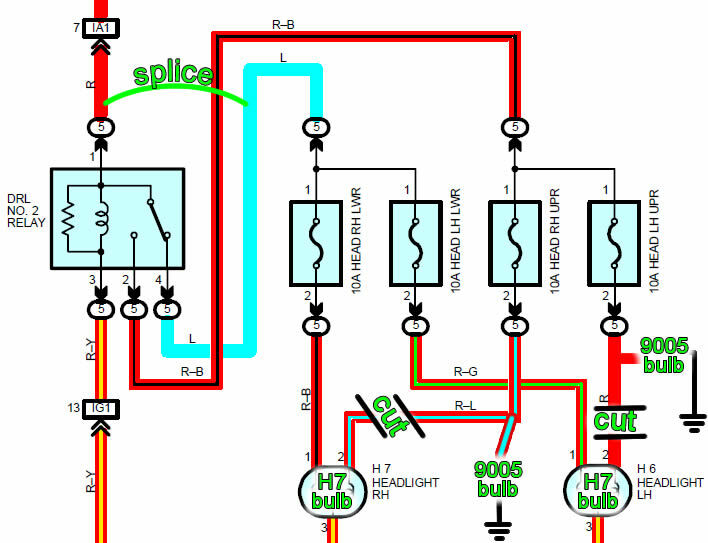 So I did a little studying of the wiring diagrams and came up with something I don’t believe has been tried before. The biggest hurdle of wiring in the newer headlights is getting them to function like they do on the newer cars, which is having both the high and low beams energized whenever the high beam lever is engaged (flashing or on full-time.) This is particularly important if you are converting to HIDs, as you don’t want them re-firing every time you flash the highs. Caution: Always disconnect the battery before any electrical work Warning: This is a modification to factory wiring, and while I took measures to make it as safe as possible, you must be responsible for your own modifications and there is no guarantee that it will not cause damage. 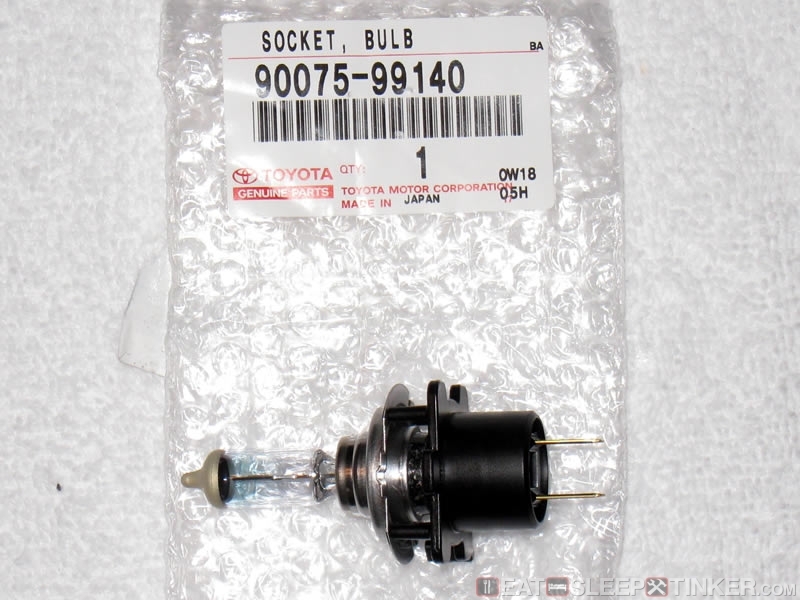 Here is the parking bulb (wedge type) plug socket. 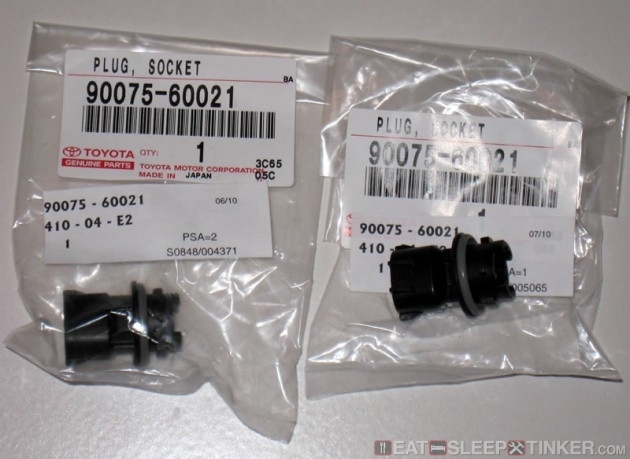 The pre face-lift socket will physically lock into the headlight housing, but there is interference with the plug and you will not be able to actually plug it in without these new sockets. The turn signal is the same, no work required. 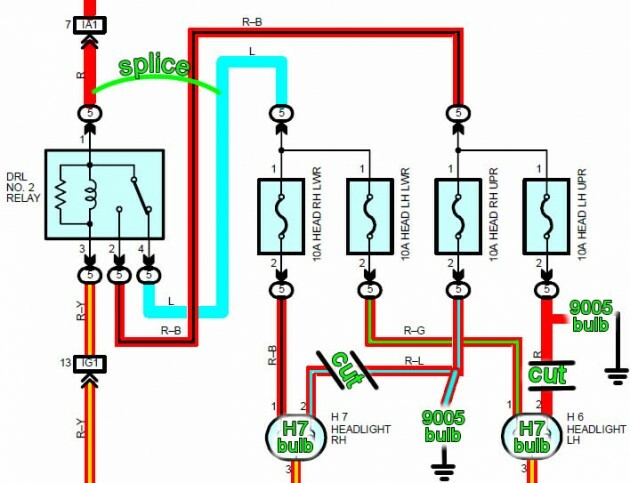 Let’s take a look at the wiring schematic. To help orient you, all the terminals labeled “5” (that’s the circle with a 5 in it) are located in the fuse/relay box in the passenger side of the frunk on the right-hand shock tower. DRL No 2 Relay is basically your relay for High or Low beam operation. You can see how it is defaulted to low beam, then switches to high, taking power away from the lows. We want to still allow for the switching on and off of the highs, but maintain power to the lows. So we make a splice between the solid red power wire and solid blue low beam power. The low-beams are ground switched at the BCM, so they will only be on if the DRLs are operating or you physically turn the lights on at the stalk. This is the actual wiring of what we were just talking about. The relay box simply unclips from its mount, allowing you to turn it over and access the bottom. The bottom panel also unclips, allowing you to access the wires inside. Locate the large gauge solid blue wire and the medium gauge solid red wire. These will be spliced together using the wire tap. You will have to modify the wire tap to allow both wires to pass straight through (basically use a knife to remove any plastic that prevents the wires from going through.) Crimp the tap down, ensuring the bridge cuts into both wires, then close the plastic clamp. Tuck your wires back into the relay box, put the cover back on, and clip it back to its mount on the shock tower. Now for wiring the actual plugs. Cut off your old H4 plug and discard. You should be left with three wires: RB, RL, RY (right) and RG, R, RY (left) Note: my left hand wires had RL instead of just R, no big deal. 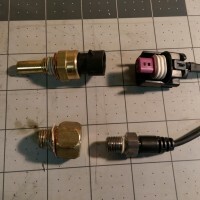 Connect your RB(RG) and RY to your H7 plugs. Connect your RL(R) to your 9005 plug. The other lead of your 9005 plug will run to chassis ground, this is where you’ll need that wire and ring/spade terminal. There is a factory grounding lug on each shock tower in the corner of the frunk, this is what I used for ground. 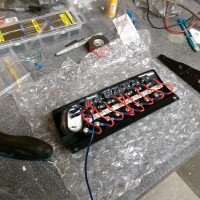 I soldered all the wires and used heat shrink, then covered them with the split loom and electrical tape. So what is different about this technique: it uses the factory wiring channels for power to high and low, which means you retain your factory fuses. 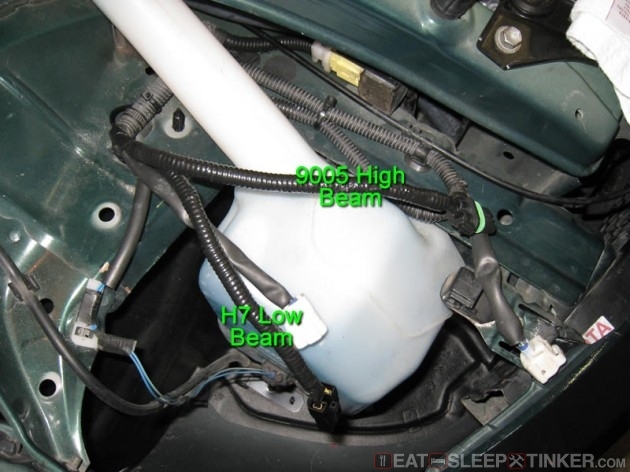 So you can blow a fuse independently for High or Low beam, which is safer and aids in troubleshooting. Additionally the two beams do not share the same ground, so you aren’t over-loading the BCM with double the amperage it is expecting. The DRL operate as normal, and you can still wire in a DRL kill switch as I have. 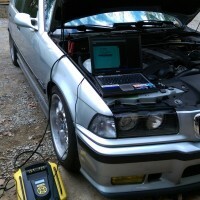 Everything operates just as it would on a ’03+ car. Thanks for the detailed writeup. I'm planning on adding HIDs when I upgrade the the facelift lights. 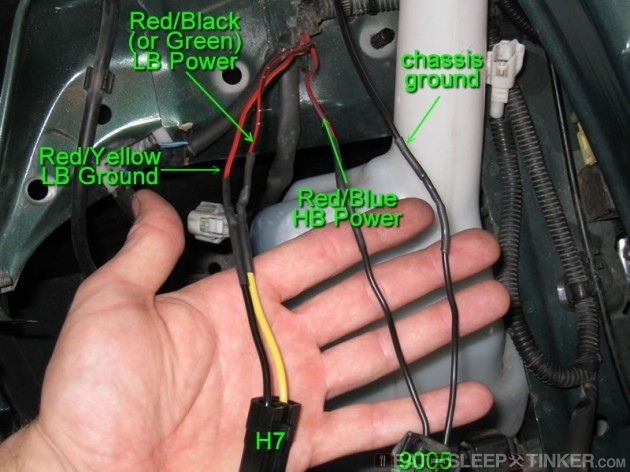 If I'm understanding correctly, once everything is wired up according to your directions the low beams will remain as the DRL source. With HIDs in the lows I know this would present a problem as the ballasts require full current at all times. How would I go about retifying this? Would simply disabling the DRLs by cutting the wire in the interior kick panel do the trick? @velocity211 I would use the power to the low beams to close a separate relay that will be powered directly from the battery. 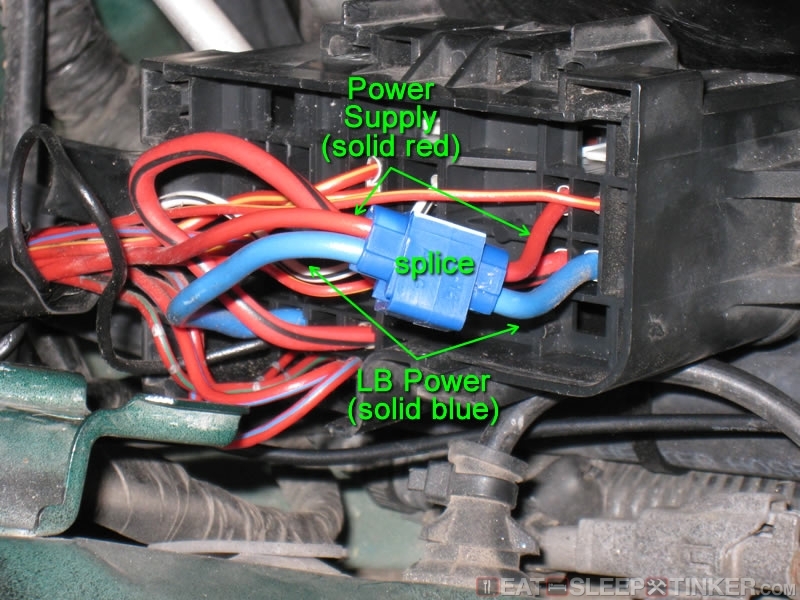 The stock wiring and relays aren't designed to handle the amperage draw that the HIDs need to fire off. well I have the 03 one with the newer headlights but they got busted and I can't seem to find those at a cheap price and got some headlights from the 00'-02' year model and Didn't know the connectors were different. Since the bulbs in my old headlights still work, could I stitch them over to the older style headlight? Not simply by plugging and playing. The housings aren't compatible, the 00-02 uses a dual filament bulb, the 03+ uses a projector for low and reflector for high beam. It would require rewiring (essentially the opposite of the work I did) to allow a 00-02 light to work in a 03+ and you would still need different bulbs.